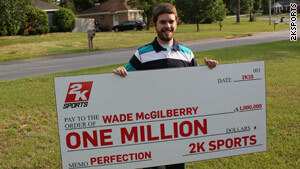 Wade McGilberry received a huge check for pitching a virtual perfect game in "MLB 2K10." Alabama man wins $1 million by pitching perfect game in "MLB 2K10"
(CNN) -- When Wade McGilberry bought a new baseball video game that offered a cash prize to the first player to pitch a perfect game, his wife urged him to skip work and stay home to play. He didn't listen to her, but things worked out anyway. On his fifth try with "Major League Baseball 2K10," McGilberry achieved the elusive feat and won $1 million in 2K Sports' Perfect Game contest. He used Kenshin Kawakami of the Atlanta Braves to record a perfect game -- allowing no batter to reach base -- against the New York Mets. His entry, recorded on March 2, was just verified by 2K Sports. McGilberry, 23, of Mobile, Alabama, said he played the demo for a couple of weeks before the game's release and picked up the game at midnight the day it came out. His wife, Katy, fully supported his efforts to win the cash prize. "She told me, if I was going to be serious about this, that I should stay home [from work] and play the game," said McGilberry, a 401(k) record-keeper. "I decided to go to work anyway." McGilberry said that once he got home from work that evening, he immediately turned on his Xbox 360, determined to play until he completed the challenge. An hour and a half later, he had done it. He said he had to hit the reset button only 5 times. McGilberry believes there is a lot more skill required to play "2K10," which uses avatars of real major leaguers, than just button mashing. A player must choose each pitch but also know his pitcher's strengths and each batter's weaknesses. There were some tense moments in his perfect game when McGilberry thought he was going to have to start over. "The very first batter hit the ball up the middle off my pitcher. It deflected to the shortstop, who threw him out," he said. "One guy in the eighth inning hit the ball to the warning track." McGilberry got to a full count on only one batter. His strategy was to pitch to the corners, keep it low and not throw hard. He said he got a lot of ground-ball outs that way. "When I got the final out, I was waiting for something to pop up," McGilberry said. "I kept waiting for the game announcers to say something. I was worried I had screwed something up." The confirmation code produced by a perfect game appeared on his screen, and McGilberry immediately called his wife. "She tried to be the voice of reason," he said. "She told me that probably some college student who played all day got the perfect game before me." The rules of the contest stated that the game had to be recorded with a timestamp and that entries would not be judged until the contest ended May 1. 2K Sports received several dozen submissions but said McGilberry's was the first to meet all the criteria to win the $1 million. Mike Rhinehart, senior product manager with 2K Sports, and Greg Thomas, president of 2K Sports, surprised McGilberry at home this week with a giant check to commemorate his achievement. McGilberry said it had been four or five years since he played a baseball video game. He and his wife have big plans for their winnings. "We are going to pay off the house, get our finances in order," he said. "We are also going to start a family, which we had planned to do once our finances were together. They are just together sooner than we thought."